VW: 90 percent of concept will be in production car. 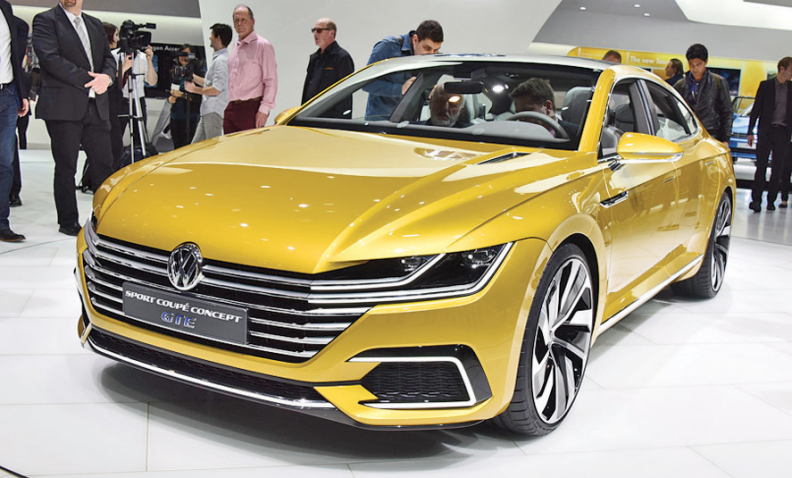 GENEVA -- Volkswagen's Sport Coupe Concept GTE, a four-door fastback that debuted here, is very close to the production version that will replace the CC and eventually could be built in the U.S., VW executives said. The plug-in hybrid concept, which showcases a new, sleeker design language for the brand, combines the functionality of a large tailgate and the interior space of a four-seater. Based on VW's flexible modular transverse matrix architecture known as MQB, the CC successor will be aimed at customers who would like a Mercedes-Benz CLS or BMW 6-series Gran Coupe but want to spend less. "This vehicle concept is very near to the series version, and it could be manufactured in the foreseeable future," VW brand development chief Hans-Jakob Neusser told Automotive News Europe. Production will start in Emden, Germany, and China, he said, adding that the level of demand will dictate whether it also would be built in the U.S.
VW's Chattanooga plant is being reconfigured to produce an MQB-based large crossover for the U.S., meaning it would be relatively easy to add another MQB vehicle such as VW's fastback concept. One VW source said volumes no longer had to reach the 100,000 mark before it made economic sense to build in Chattanooga, thanks to the flexibility provided by the MQB platform. While VW sold nearly 100,000 Chattanooga-built Passats in the U.S. last year, it only managed a tenth of that for the CC, which is imported from Germany. VW brand head of design Klaus Bischoff said 90 percent of the Sport Coupe Concept GTE shown here would end up in the final production version, with just a few stylistic elements that will be sacrificed in the end, such as the Tesla-style handles that are flush with the door. The car would fill a gap in VW's lineup between the Passat and the Phaeton flagship. The Sport Coupe Concept GTE comes equipped with two electric motors and a 3.0-liter V-6 TSI engine that can propel the car from 0 to 62 mph in 5 seconds. A 10.7 kilowatt-hour lithium ion battery gives it a 31-mile electric range.